The finish line is in sight for 2018, but rather than slowing down we’re speeding up for the final sprint. This means some high-volume bug eradication, and the imminent launch of one of our biggest and most-requested integrations ever. Continue reading for details, below. Every year, there is a surge of appointments across all industries in the month of January. We attribute this to everybody making their New Year’s resolutions. Are you ready for the flood of new business? If you don’t want to spend your holidays helping customers book their January appointments over the phone, then you should know about Live Booking. Live Booking gives your business a team of live receptionists who will answer your phones this holiday season, and help customers book appointments directly to your Setmore calendar. Sign up for just $1 USD, and free yourself up to enjoy the holidays, while still preparing for the New Year business boom that’s just around the corner. Currently available in the US and Canada. UK and AUS users, email us directly to sign up. We are in the final stages of the Square beta, and we’re just about wrapping things up. While we can’t give an official launch date, there is a high probability it will happen before the end of the year. You can use the Square integration with the free, basic version of Setmore. This is unlike the Stripe integration, which requires a Setmore Premium subscription. Finally swipe, tap, and dip cards to accept payments. Generate better in-person experiences with your customers when you don’t have to manually key-in card info. Payments round out your online booking experience. This integration shortens the distance between service delivery and profit, making it easier to run your business. We’re excited, and we want to share that excitement with you! It’s an exciting time for online booking. Fixed an issue that sometimes caused the “Confirm Your Information” screen to show after the customer already booked their appointment. Fixed an issue that caused some future appointments to not display in the Customer Login Profile’s “My Schedule” tab. Fixed a design break with the menu icon for iPad visitors. Appointments scheduled from the Booking Page will no longer indicate that they were booked from the Calendar. Fixed a design break that sometimes occurred when the Service/Class duration is disabled. When editing the Booking Page URL, users can no longer save a blank value. Class images will now display properly under the Classes tab. Fixed an issue that prevented customers from editing future appointments in the Customer Login Profile, if multiple appointments were listed. The “Thank You” screen will now display promptly after a customer submits a review. Fixed some minor design/spacing issues across all email templates. Fixed an issue that sometimes caused email notifications to not send when replacing the customer of an already-booked appointment. The “Book Appointment” button will now work properly in Hotmail and Outlook inboxes. Custom form fields will now display in the proper order for customers who reschedule an appointment from a Setmore email. Fixed an issue that caused some staff to not receive a confirmation email for new class attendees. Fixed an issue that sometimes caused clicks to not register on the calendar. Fixed an issue that caused the calendar to jump ahead two weeks when using Setmore in a Firefox browser. Custom Cost and Custom Duration will now take immediate effect while still in the Create Appointment window. Fixed an issue that caused some new accounts to revert back to the initial setup flow after booking a few appointments. Fixed an issue that caused tooltips to stop working in the Class Session details window. Fixed an issue that sometimes prompted an “Invalid Resource ID” error message when attempting to sync class appointments to external calendars. When dragging-and-dropping or drag-extending the duration of an appointment, the Activity Stream will no longer display a “Customer Added” message. Rescheduled and Deleted Class Session notifications will now display instantly as intended, rather than after refreshing the page. Fixed an issue that caused some cancelled appointments to indicate they were rescheduled in the Activity Stream. Adjusting an appointment label will no longer prompt an “Appointment Rescheduled” notification. Cleaned up various design breaks in the Customers tab when using Setmore in a Google browser on an iPad. When sorting customers alphabetically, customer names will now properly appear in order as intended. When importing customers from Google, names in different languages will now properly display in Setmore. Fixed an issue that prevented the deletion of customer profiles until one day after their last booked appointment. Customers added through the Setmore iOS app will now properly sync to a Zoho account, when the Zoho integration is activated. Selected tabs in the Staff Profiles area will now properly highlight for accounts with more than ten staff profiles. Buffer time will no longer accept negative integer values. Active tabs will now properly highlight when using Setmore on an iPad or mobile device. When the currency is set to the Chilean Peso, services will no longer display cost with a decimal value. Hardest working bunch of people ever! I love Setmore and so do my clients! Soooo excited about the Square integration. I think that Setmore & Square are among the best business tools available. Hats of to you all! Your Timezone data is old, More countries now they don’t change their timezone to day light saving! Please Update your Timezone Database. Hi Ali, we’ll look into it. As far as I recall, we use the same standardized timezone tables that Google does, but I could be wrong. 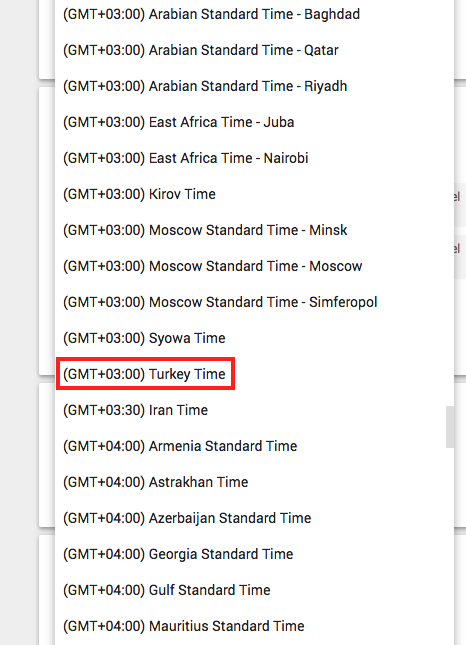 Unlike Google, They update their time zone accurately! Thanks Ali, these screenshots help. I checked with our development team and we’re already aware of the issue and have been working on a solution. We anticipate the issue will be fixed in late December. In the mean time, you can select a different GMT+3 timezone to make sure your calendar is showing the correct time. I’d love a feature that allows me to reply to the automated email, with the reply-to address being the address of the customer that booked. Hopefully this is possible and coming soon! Great updates this month. Surprised to see that the new “appointment details” button was not mentioned in this set. Hopefully over time new insights appear in that little popup. Also great to see that the unresponsive clicks was addressed. It was a consistent problem, usually clicking 3-4 times would address it. Looking forward to the end of December, when the new updates are released. Also completely forgot to mention, email reminders are entirely useless to us because they aren’t customizable like text messages. We don’t allow customers to choose their employees, which is completely standard in the field we’re in. In fact, customers aren’t even aware of who performs their work; Which is why we don’t want that information being sent in the email reminder. Hopefully new plans will be released to allow us to completely build the email content.